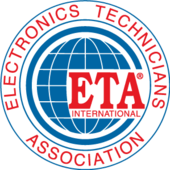 ETA® International is a professional trade association representing electronics-related industries with accredited vendor-neutral certifications. ETA offers over 80 technical certifications in a variety of industries such as: Basic Electronics, Communications, Fiber Optics, Information Technology, Renewable Energy, Workforce Readiness, Biomedical, and Smart Home. Developed by industry experts, ETA certifications confirm technical knowledge necessary to be successful in today’s high tech world. Hands-on verification is also available for various certifications. ETA certifications prepare candidates to earn lucrative incomes in many exciting careers. ETA-certified professionals work for many well-known companies like Motorola, Google, ADT Security, Microsoft, Verizon Communications, Boeing, United States Armed Forces, and more.